I've amended the "Whats It Called" posting again. You can scroll down a few entries to see it. Also, a long time reader has suggested it might be worthwhile to mention the below link. I do try to stay away from commercial aspects, but I have had a few enquiries about repairs to vintage mechanical pencils, so I'll bend the rules a bit, again. Just for the record though, I know nothing about RichardsPens.com and have not used their services. From time to time, clients ask if I can repair mechanical pencils. I hadn’t started out to be a pencil mech, but I don’t like telling people no, and my success rate has turned out to be pretty good. If you have a pencil with a problem, please contact us to see about resurrecting it. I have a small supply of parts for vintage pencils, and I can frequently adapt parts or repair existing parts to get your pencil working again. Yet another tale of me falling victim to my own weaknesses. It was a little under two years ago, Christmas was coming, I was in a stationery shop, I was happy, there on the counter was a Parker pen and pencil set at a never to be repeated special Christmas price…you don’t need to be a rocket scientist to know what happened next. Not that I’m now unhappy with my purchase, but really I shouldn’t have bought it, it doesn’t really fit my collecting criteria. But then again, most of my collection doesn’t fit my criteria. 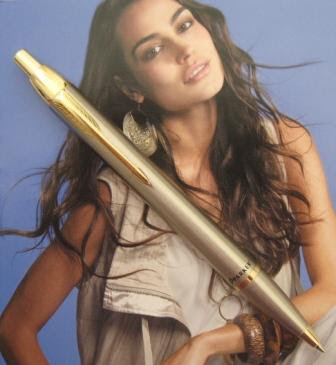 My Parker IM mechanical pencil and ballpoint are brushed nickel with gold trims. This combination doesn’t seem to exist on the Parker website - the current IM’s seem to be mostly coloured plastic bodies, and they have a distinctly different pocket clip and top section, so I assume my version has been discontinued. But then I still see it in shops around here, so??? 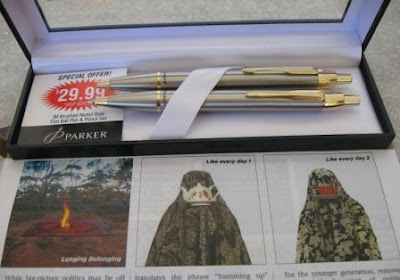 You can get the ballpoint by itself, but the pencil seems only available as part of a twin-set. I suppose one day I should put in the time and effort to learn to recognise a nickel from stainless steel body, but to the uneducated eye they are pretty similar. Then there’s learning to tell chrome plating from nickel plating. Too much hard work. My first impression of the IM is that it is a bit of a “fat boy”. With an 11mm diameter it is on the large side of town, but somehow its overall appearance is of something wider again. Must just be the combination of length, angle of the tip taper, etc all just combining to give the impression of extra width. Not that I’m against width, just somehow this pencil ends up looking a bit short and squat for my personal taste. The brushed nickel finish on my IM is quite bright and reflective. The gold trims – that’s tip, front band, pocket clip and top section inc. push top button – are quite a light gold colour so I believe that makes them a fairly low carat gold alloy. This means there isn’t a huge colour contrast between the nickel and gold in a lot of lighting situations as both are very nice and shiny. Personally I think the minimal contrast might actually be better than if there was a big contrast with a high purity gold alloy as I’m not generally a big fan of gold-silver combinations. But each to their own. In the hand the IM is not particularly heavy for a largish metal pencil. There are no grip enhancements although the brushed finish must provide a little more grip than a polished finish. I personally found it a little too wide for my tastes as my preferred grip zone was basically up at the full diameter of the body, and the gold band was sort of in the way too. Unlike some metal pencils, this one didn’t seem to have any annoying rattles. The lead sleeve is a short fixed cone so this isn’t really a pocket friendly pencil. Moving up to the top of the pencil, the push top button is fixed on, there is no eraser hidden underneath. Ten clicks on the button will get you about 7mm of the 0.5mm lead. I certainly had more than my usual share of lead breakages whilst using the IM, so I don’t think the lead supplied with the pencil is of a particularly high grade. Replacing the lead - well that’s a bit difficult in the absence of instructions. The push top button doesn’t come off, so that only leaves unscrewing something. The front section was the obvious choice and appears to be the correct method. As is common with these disassembly systems you have to have things all correctly aligned and positioned when you reassemble or the ratchet lead advance won’t work. So, yet again, come on, someone from the writing instrument companies read this blog and decide to supply instructions on how to refill the pencil. Seriously, this blog has taught me that there are a lot of people out there who don’t even know mechanical pencils are refillable, let alone how to work out how to refill a difficult one like this that requires significant disassembly of the writing instrument. The pocket clip is not spring loaded but is a good strong piece of metal that works well. It is of course made with the Parker arrow tradition in mind. 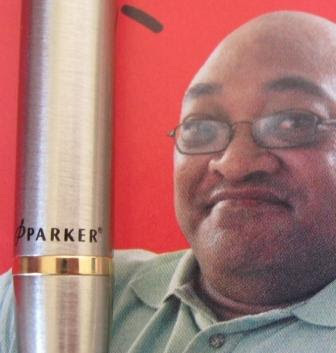 The Parker “P” logo is embossed into the top of the push top button. The “P” logo and “Parker” are printed in black just above the front gold band. I actually really like the look of that. Quite stylish. How long the printing will last though is another question. 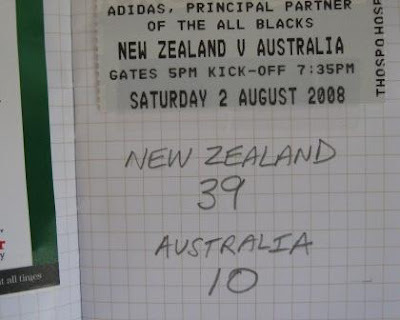 Best Points – I really like the Parker name printed down at the front. Not So Good Points – Difficult to refill. Price Range – Low, as part of a set. Dimensions – Length 141mm, diameter 11mm. Balance point about 70mm up from the tip. 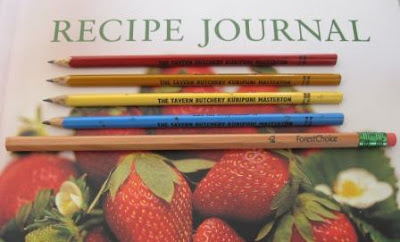 Recently a reader left this comment “Why don't you make a top 10 or larger list, listing your favorite pencils? You could even do it for every price range!” This isn’t exactly the first suggestion I’ve had along these lines, but this time I’ve finally decided it is a good idea to list my favourites. So, I’ve created my list, “Dave’s Top Five” over on my organiser site. There's also a link in the sidebar. With hundreds of pencils to choose from, it was a pretty tough job creating such a list, and there were a few surprises for me. I saw this video over on The Pen Addict. It's a video lesson on how to write like an architect with a mechanical pencil. I haven't put a copy here because I'm not sure of the protocol etc regarding posting other peoples YouTube videos. Anyway, check out the video, I enjoyed it, and I congratulate the cast and crew for filming it. Whenever I look at architectural drawings I am often reminded just how different their drawing is to the mechanical drawing that I was taught. I always assumed architects just had another set of rules for their drawing. This video really brings that home. As I watched it, I was struck by just how different (wrong) it all was to me - back in my classes this demonstrtion would have got a really big F for Fail. My tutors would have gone crazy. I assume that architects will find nothing particularly wrong about this video, but what about the engineers out there? Is it just me? Am I the odd one out? Was I taught so differently to other engineers? For the record, here's a quick list of some things I jotted down as I watched the video, but I wouldn't say it's exhaustive. Variable line widths, using a chisel edge - always a big No No in my classes. Stylised lettering, letterforms not always vertical/horizontal, open letterforms, variable height & width. Arrowheads not closed, incorrect length to width ratio, points not meet. 29-Sept: This posting has been amended again! Here’s a question for all you folk out there in blogosphere. What are the words for pencils and mechanical pencils in your part of the world? Also, if you are in a non-English speaking country, what is the literal translation into English for your terms? I’ll start. Here in NZ, if you want a wooden pencil then you ask for a “pencil”, and if you want a mechanical pencil then you ask for a “mechanical pencil”. 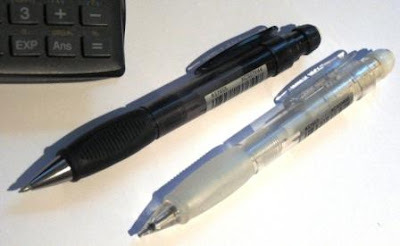 However, back when I was young if you wanted a mechanical pencil you would have asked for a “propelling pencil”. Sometime around the 1990’s or so the term “mechanical pencil” started to take over from “propelling pencil”. My sources tell me that in Denmark, the word for a wooden pencil is “blyant” which translates into English as “pencil”, i.e. a wooden pencil. However, the Danish term for a mechanical pencil is “pencil”. Yep, the English word “pencil” has been taken into Danish as the term for a mechanical pencil. So, if you are out shopping in Denmark and ask for a “blyant” you will get a wooden pencil, and if you ask for a “pencil”, you will get a mechanical pencil. They also do have other terms for mechanical pencils such as “skrueblyant” which literally translates as “screw pencil”, or “trykblyant” which translates as “push pencil”, but plain old “pencil” is the most common. Heading south across the border into Germany, the term for a wooden pencil becomes “Bleistift” which translates as “pencil”, and for a mechanical pencil there is the generic term "mechanischer Bleistift" ("mechanical pencil") but the more common term is “Druckbleistift” (pressure pencil). There is also the seldom used “Feinminenstift" (“thin lead" pencil). Note that in both German and Danish the word for lead (“Blei” and “bly”) is usually in the name. So, what are the terms in your part of the world? Please, leave a comment. OK, well this is an addition to the original posting above. As I said last amendment, thanks very much to those of you who have commented so far, all very interesting to know. Interesting to note some of the variations in the Spanish speaking world, and even in a geographically small country like Denmark there is some discussion. On the other hand, across the far flung countries of the English speaking world, no one has suggested any other term for mechanical pencil. It's not a contest, but I must say that my favourite terminology is from Croatia, I really like the idea of strolling into a shop and asking to see a selection of their finest "technicals". Just FYI, over the last few days I've added a few new links over in the sidebar. drafting pencils with the plastic barrel replaced by one of exotic wood. 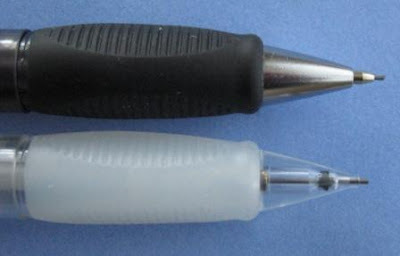 The mechanics are taken from a genuine Pentel P205 pencil, including the eraser, cap, clip, and metal tip. As shown in the picture, they are either tapered or flared a bit at the tip, and come in several different woods. Mine is a tapered model made out of African blackwood. It is a very dark brown, with little visible grain, and is slightly thicker than the standard P205 pencil at the grip. The wood is polished to a very smooth satin finish. I do not believe that it has varnish or any other coating, but is perhaps polished with oil like furniture polish or something. I replaced the fixed sleeve tip with the tip from my Sliding Sleeve Sharp PS535, and it works great. At the arts and crafts fair I was at, the artist had a couple dozen pencils on display, and no two were the same. Several different woods were represented, ranging in color from yellow, red, and various shades of brown, to nearly black, and each had a slightly different shape, since they are turned by hand, without the use of any templates or guides. I chose mine based primarily on the feel, though I liked the darker color better than some of the other woods. $13 seems very reasonable for a handmade quality pencil. Thought you might enjoy a different take on the wooden pencil. There are a few non-pencil articles posted on this blog, and they obviously don’t really fit all that well. I’ve decided to create a new blog for those occasional non-pencil postings that I feel like doing. In case you are interested it’s “DMP Lead Free”, and there’s also a link in the sidebar under General Blogs. 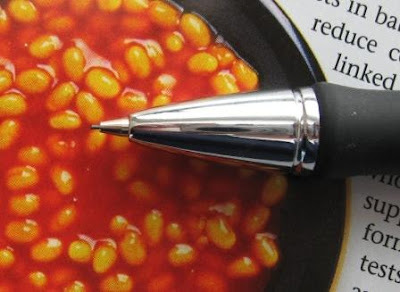 I see plenty of very nice looking ballpoint pens around the office at work. They invariably have a rubber grip, shiny metal trims, and the name of one of our suppliers printed on their brightly coloured metal bodies. Hey, everyone likes a freebie. The problem I have is that initially they always look quite good, but after a few months or so you can really see they were all surface and no substance. 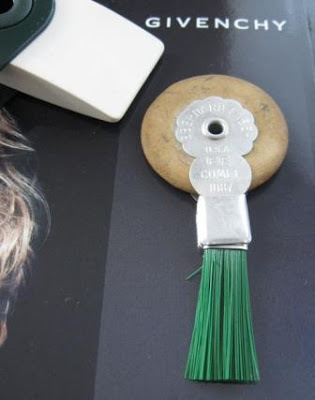 The rubber grips are falling apart, the trims and body colours are wearing through showing base metal or corrosion. Of course they have often had a hard life with little care or attention so the scratches, bent pocket clips, chewed tops, etc are wilful neglect and abuse but the end result is the same – from beautiful show-pony to ugly mutt in a short space of time. Most of these pens seem to be of a very similar style, and my problem is that the Pentel Client looks like it is part of that same continuum. It looks like the flash but cheap pen one of my suppliers leaves on my desk along with one of their printed notepads. It’s called Client which even implies it’s something you give away as a promotional item. Then I see “Made in China” on the sticker and the warning bells just start ringing inside my head. 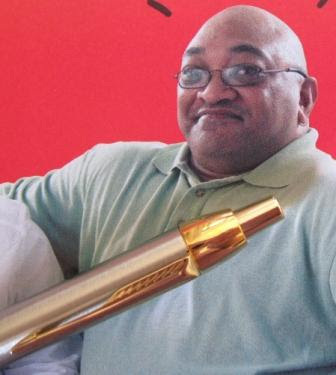 I visited the Pentel USA website and they describe the Client thus, “Smooth, sleek, affordable automatic pencil with an expensive look and feel. 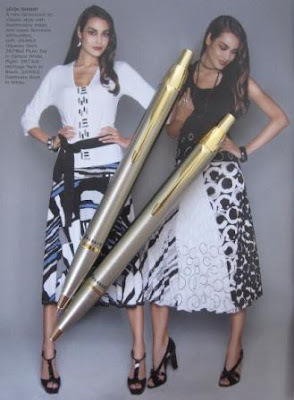 Matching design with BK910 Client ballpoint pen.” With expensive look and feel – see, that doesn’t really make me feel any better. Having to point out that your product looks and feels expensive, well that never fills me with confidence. I’d really like to put the Client through a 6 month review period but I just don’t have the time. I thought maybe I should cancel this review because I was probably too prejudiced to be fair, but I decided to persevere. Right then, away we go. 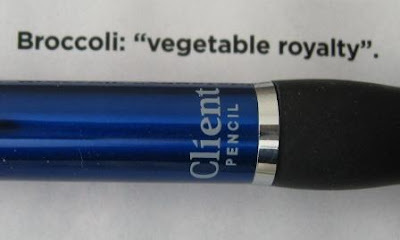 Well, Pentel are right, the Client does look and feel expensive, but as above you know that to me it is that standard inexpensive “expensive” look and feel. So, maybe I’m a snob and the truth is out? Leave you to judge that. Anyway, my Client is blue because that’s one of my favourite colours, and it’s a really nice deep lustrous blue. In artificial light you also get some nice colourful effects. The body is metal, coloured blue, with chrome metal trims and a black rubber grip. The pocket clip is a good sturdy piece of chromed metal - there will be no accidentally sliding off whatever you have clipped to. One of the things I often dislike about these “expensive look” pens and pencils is the pocket clip. Anything more than a quick glance reveals that they aren’t, expensive. The Pentel Client’s pocket clip is no exception. It's the way they attach the clip to the body that always seems to let the side down. Nice fancy clip...lets just bend the end over and stick it on. I’m not a fan of rubber grips, but this one does have some mitigating features. It’s a standard round cross-section and the compound is quite hard so there isn’t really any give in it, but it does have a little tack and thus grip to it. However its number one good point is its shape. The contour is very well sculpted to position and hold your fingers in the correct position. Excellent stuff, I don’t know why more grips aren’t contoured like this. I think most people would like the feel of the Client in their hand. No prize for guessing this is a push top ratchet lead mechanism. Ten clicks will get you 5mm of the 0.5mm lead. 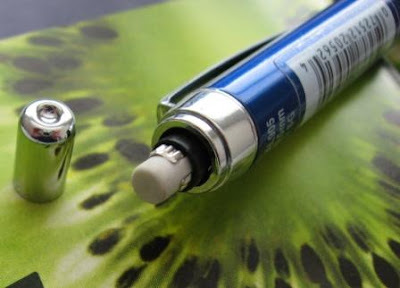 Remove the top button to reveal the usual mini eraser and you pull that out to access the lead chamber. 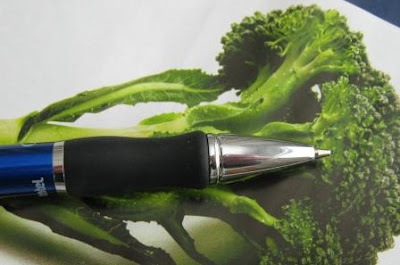 Down at the other end of the pencil, the lead sleeve is a writing style short cone, retractable for pocket safety. 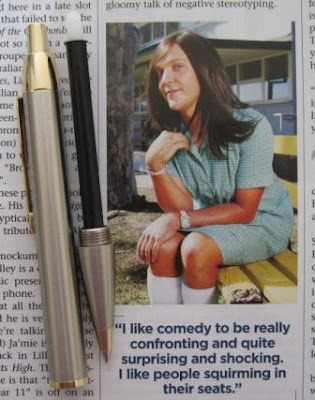 I’ve reviewed plenty of very expensive pencils and plenty of economy priced pencils too. Many of the economy and low priced pencils have been excellent products, but I just don’t get a good vibe from the Client. 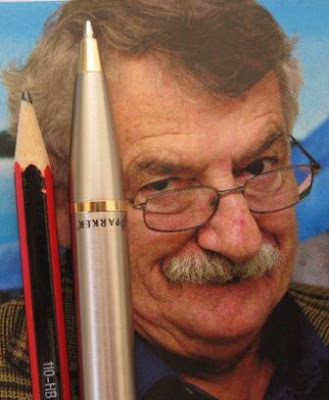 I’ve always thought of Pentel as a good solid, reliable honest no-nonsense brand, and the Client just doesn’t fit that picture. It’s trying to be something it’s not. I say spend you money on an Energize or a P205 or any of the other many excellent pencils that Pentel offer. Best Points – The grip contouring is very well done. Not So Good Points – Trying to masquerade as something it’s not. Dimensions – Length 138mm, width 10mm across the main body. Balance point about 65mm up from the tip. I hate writing negative reviews. Somehow I seem to end up with way more than fair share of wooden pencils. I collect MPs but I end up with all these WPs too. For some reason I have always thought triangular wooden pencils were a reasonably recent development, perhaps because I don’t recall them from my childhood. However, as the WPs slowly accumulate in my house it is apparent to me that triangular pencils are nothing new. Here’s a a batch of recent arrivals. They are quite thin compared to ‘normal’ pencils, about 6.1mm (1/4 inch) along each side, and somewhat shorter than usual as well. I guess it helped keep the price down. Photo: 4 old triangles with modern hexagonal Forest Choice and Staedtler for size comparison. I don’t think this shop is in business anymore. Hmmmm, a refreshing ale whilst you bought your steaks. Clearly the owner made his fortune and retired to lead the good life. Manufacturer unknown, but “Made in England” is printed on them. Must not collect erasers, must not collect erasers, must not collect erasers, must not collect erasers, …it’s a constant struggle. I’m kind of surprised at how much design and marketing effort seems to go into erasers these days. Here’s three. 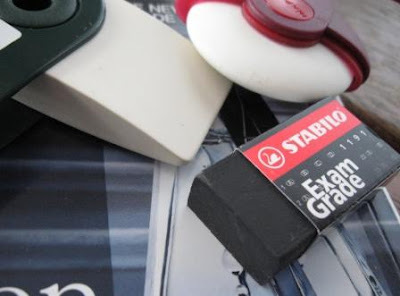 Faber-Castell 82-182410 Sleeve eraser. I like the idea of the swivelling sleeve and fine edge, but I guess even with care the edge wouldn’t last all that long. 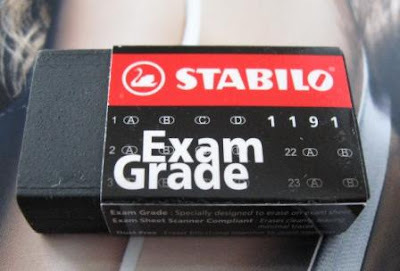 The eraser case is about 70mm long x 33mm wide (2 ¾ x 1 ¼ in). 83 votes, 53 votes (63%) for YES and 30 votes (36%) for NO. Ahhh, here we have it, the preferred pencil of Sumo wrestlers. Surely this will be a real handful of a mechanical pencil. Well, I have seen bigger grips (e.g. Sensa) but there is no doubting the SumoGrip is sized for big hands and those who like a jumbo sized grip. Therein lies the problem for me, I am not one of those people. To make matters even worse the grip is a bulging convex shape, widest in the middle of its length. I’m not a fan of convex – give me concave, tapering, straight, pretty much anything other than convex. So, I’ve got to say writing with the SumoGrip was not a pleasant experience for me, but I’m sure there are plenty of people out there who like a sumo sized grip so I’ll try to put my personal preferences aside and carry on. The cross-section of the grip is a circle that has been squashed slightly triangular and the faces have grooves cut in them to aid grip. It’s made from a rubber compound which is a little “grippy” and does have a little flex in it so I guess it does aid rather than hinder your grip. Now, here’s a point worth noting. 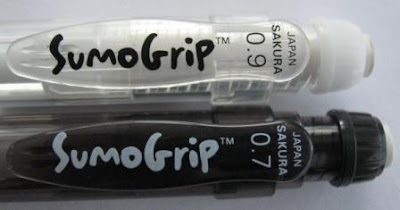 I actually have two SumoGrips – a black (or gray) 0.7mm and a clear 0.9mm. The white translucent grip on the 0.9mm pencil is noticeably softer and tackier and really does grab your fingers. I don’t know if this is just some random batch to batch difference, or an inherent difference between the black rubber compound and the white rubber. OK, well that’s the grip done to death. At the end of the day, I prefer watching Ninja Warrior to sumo wrestling on TV, so I guess I’ll just have to wait for the Ninja Grip mechanical pencil. Below the rubber grip the front tip is a tapering cone. From my pencils and the Sakura website it appears the 0.5 and 0.7mm versions have a metal cone and the 0.9mm has a plastic cone. The cone ends in a short conical lead sleeve, which is retractable on the metal cones but a fixed part of the plastic cone. So, this is definitely a writing only pencil, and the 0.5mm and 0.7mm versions are pocket safe. The lead advance mechanism is a push top ratchet – 10 clicks will get you about 8mm of 0.7 or 0.9mm lead. Again, I don’t know if its just random difference but the ratchet system on my 0.9mm pencil is markedly stiffer, jerkier and clickier than my 0.7mm pencil. Jerkier and clickier? – phew, I’m using all the technical terms in this review. 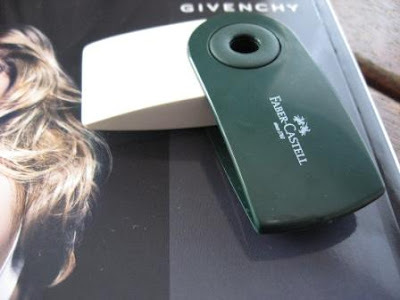 The pocket clip is a basic plastic moulded plastic clip. Reasonably functional. 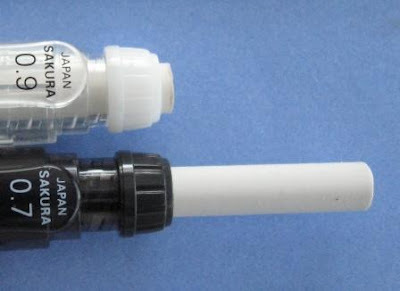 The main barrels are transparent, and the tip section is too on the 0.9mm version. I imagine many younger users would like to see the insides working as they click away. Besides the grip, the other main feature of the SumoGrip is obviously the large extendable eraser. You screw the top housing around to extend or retract the eraser. 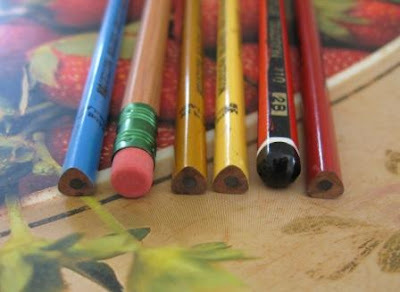 The eraser core is about 7mm (a bit over ¼ inch) diameter and has about 28mm (1 1/8th inch) of usable length. The whole eraser housing cartridge pulls out of the body to allow access to the lead magazine. Here’s a quick comparison between the SumoGrip eraser and Staedtler Mars Plastic, using the leads that came supplied in the pencils. Not much in it really. Basically a draw (tie). “SumoGrip”, the lead size, and “Japan, Sakura” are printed on the pocket clip. The Sakura of America barcode label stuck on the barrel includes model identifications like 37655 and XCS07 for the 0.7mm pencil and 37657 and XCS09 for the 0.9mm pencil. 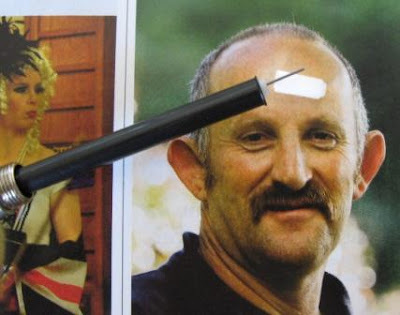 Best Points – the grip if you like a wide grip, large extendable eraser. Not So Good Points – the grip if you don’t like a wide grip, or rubber grips. The tip difference with the 0.9mm version could annoy folk who have one of the other lead diameters and thought they’d try a 0.9mm too. Dimensions – Length 139mm, main body diameter 13mm and it’s slightly triangularish but the grip diameter/width is about 15mm. Balance point about 65mm up from the tip. Note 1: I haven’t pulled them apart for detailed comparison, but I’m sure observant readers will note the striking similarities between the Sakura SumoGrip and the Staedtler Remedy. 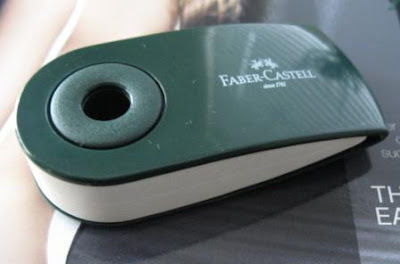 They then might think of the Faber-Castell Grip Plus and look out, it’s another attack of the clones. 2: See also Joy of Erasers, who sent me my 0.9mm Sumo Grip. Thanks J. 3: There is also a somewhat different SumoGrip II. For a very long time now I have thought it would be a good idea to carry a pocket notebook. Whenever I don’t have one, I seem to have something worthwhile jotting down, but when I do try carrying one, I suddenly have nothing to write in it. So coupled with the fact that I’ve never really found the right sized pocket notebook this means, I don’t normally have a notebook in my pocket. Recently my friend at Pencil Talk took pity on me down under and sent me four different notebooks. I immediately wanted to put Rite In The Rain to the test, and did so. Don’t worry this blog isn’t going to morph into a notebook review blog, but something about Field Notes made me decide to give the pocket notebook thing another try. 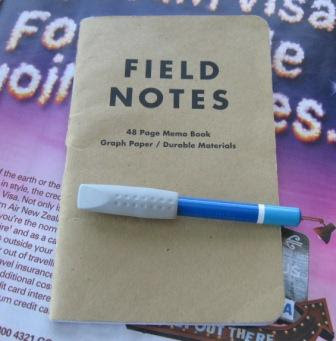 Firstly, at 5½ x 3½ inches (139 x 89mm, Note 1) Field Notes is little bigger than my ideal pocket notebook. It does actually fit in all my pockets, but often only just, and I like to feel that the notebook is right the way down and secure inside my pocket. I’ve got a 4 ½ x 3 notebook which is the ideal dimension in that respect. The 48 pages in Field Notes are graph lined on a reasonable weight paper, with a heavier weight cover. Three staples hold the pages and cover together. I was interested to see how this notebook would hold together over an extended period of time, as I suspected the cover and stapling not might stand up so well in the long term. The inside front cover has spaces for your name, dates, etc and tick-boxes to indicate a ‘handsome reward’ (or not) for returning a lost notebook. 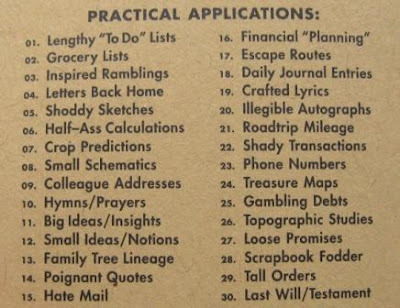 The inside back cover has lots of information about the materials and processes used in printing the notebook, and an excellent list of ‘Practical Applications’ for the use of the notebook. These little things really give this notebook a little something extra, a little personality if you like. Field Notes first got shoved into my pocket on 18 July, and I decided to always take it with me when I left the house. Monday to Friday it generally lived in the front pocket of my (office) trousers, whilst on the weekend it was often in the back pocket of my jeans. 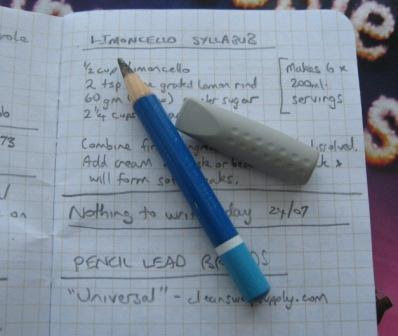 I also always carried a pencil with which to write in the notebook - a small stubby remnant of a Staedtler Mars Stenofix 101, protected by a Faber-Castell Grip eraser tip. I quickly learned that sharpening a short point rather than a long point was necessary to stop the pencil lead being broken by repeated sittings-upon, despite the protection of the eraser tip. It soon became clear that a whole week of office wear and tear on the notebook was only equal to couple of hours of weekend wear and tear. Being in the back pocket of my jeans and getting sat on and scrunched around was a lot harder than life in a cushy office environment. 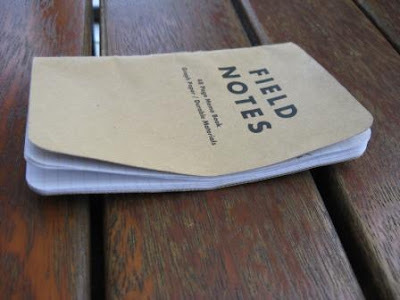 After spending time in a rear pocket, Field Notes does become, ahhh…anatomically contoured? About 6 weeks later at the end of August my Field Notes was about half full. All sorts of genuine field notes from my part-time employment as a birdlife field observer, random rubbish and notes, plus some good stuff too. For example towards the start of the trial period our monthly household electricity bill arrived and I had a conniption over the 250% increase, so I started recording our meter reading everyday and making notes about consumption. The lady of the house was not generally pleased with this campaign of electricity consumption analysis. Seeing I live in a country where agriculture is still the backbone of the economy, and Field Notes claims to be inspired by “agricultural memo books”, I thought I should put in a few notes about farming down this way. 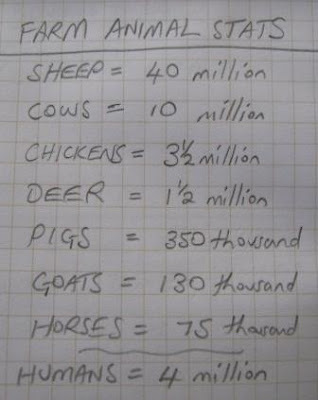 The national farm animal populations, compared to humans. Sheep ratio for the biggest sheep farmers. 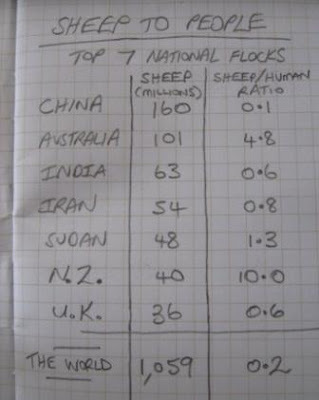 Hmmm, mighty dodgy claim, but as you can see with a ratio at about 10 to 1, we can claim to lead the world sheep statistics. Over the 6 weeks of use, Field Notes stood up pretty well. A bit battered and bent, but nothing major. My worries about the strength of the cover and the staples appear basically unfounded. After about 4 weeks a small split appeared in the cover above the centre staple, but it didn’t get too much worse. I didn’t start to worry about the cover detaching from the pages. So, overall I’m pleased with my little trial at carrying a notebook, maybe I’ll even continue to do so. Of all the things I wrote in Field Notes, the most satisfying, were two little numbers. 39 and 10, in the correct order. Note: Long time readers of this blog may have noted that I have used US customary units (i.e. inches) as the primary measurements in this posting. 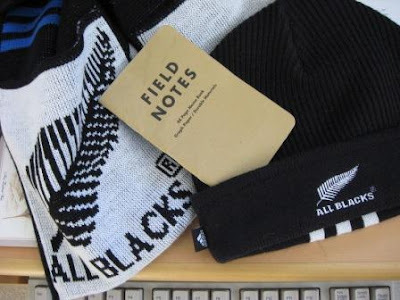 Since Field Notes is proudly ‘Made In The USA’ it seemed appropriate. Hmmm, according to Wikipedia, the USA, along with Myanmar(Burma) and Liberia, is one of only three countries to not have officially adopted the metric system. 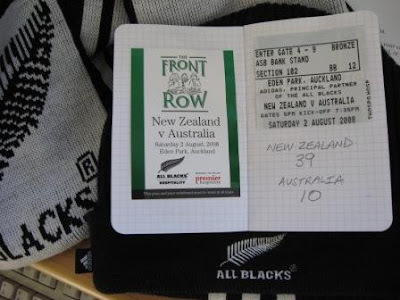 I was only a little fellow, but I do remember the fun times in the 70’s when us Kiwis converted to metric. Changing every roadside speed and distance sign in the country – now that was the time to own shares in a sign-making company! Maybe for the international market Field Notes could put a metric ruler down one cover edge to compliment the inches ruler on the inside back cover.